Do you believe in reincarnation? It’s an intriguing question as old as humanity itself. There have, of course, been claims through the centuries from those who say they were someone else in a past life, but such claims are easily dismissed as being motivated by profit or simply to garner attention. The fact is that there really is no way to prove that reincarnation is real. But before we completely shut the door on the notion that we die and are reborn, watch the following video. In it you’ll meet 10-year old Ryan, whose mother is a devout Baptist, a religion that frowns upon the idea that we can come back after we die. Ryan, it seems, often had difficulty sleeping through the night and one day he told his mother that he was somebody else. The young boy then went on to recount a career in showbiz, international travel and specific details surrounding the life of a little known Hollywood actor. One day, when looking through a book about the golden age of Hollywood Ryan spotted a picture… of himself. That’s when Ryan’s mother turned to Jim Tucker, a child psychologist at the University of Virginia. Naturally skeptical when approaching such a thing, Tucker quickly realized that Ryan’s case was not one of delusional disorder. Rather, Tucker’s research into the man Ryan claims he was started turning up some amazing coincidences. In fact, 55 of the claims Ryan made about his past life checked out. Moreover, and perhaps most convincing of all, is that Ryan claimed he died at the age of 61. Dr. Tucker hunted down a birth certificate for the man and eventually confirmed that the man Ryan claimed to be lived to the age of 61. The kicker? None of the information about Ryan’s past life was available on the internet, so the information Ryan recollected must have come from some other source. Dr. Tucker indicates that there have been other cases like Ryan’s – about 2,500 of which have been extensively documented. So what do you think? 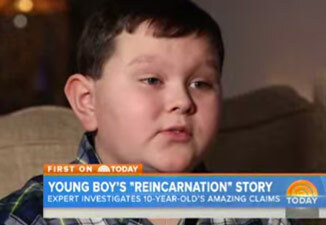 Is reincarnation possible? Or are Ryan, his mother and Dr. Jim Tucker just making this up?